Achieving 7.2 percent economic growth in the next fiscal year is possible if three criteria are met, Akbar Ali Khan, a former caretaker government adviser, said yesterday. Bangladesh will achieve the GDP growth target if: there is no natural disaster, global fuel prices fall at least 20 percent and the fiscal and monetary policies are managed prudently, Khan said. Khan’s optimistic remark comes at a time when many economists were sceptical of the high economic growth target. Addressing a discussion on the proposed budget organised by the Bangla-language newspaper Prothom Alo, Khan said the economic growth will not be in a linear fashion. He is not too supportive of the government’s expansionary fiscal policy on the grounds that exchange rate would shoot up giving way to a higher inflation, which, in turn, would create uncertainty in the economy and have a negative impact on investment and sustainable development. On the government’s recent agreement with the International Monetary Fund (IMF), Khan is doubtful of whether the targeted economic growth could be achieved or inflation could be controlled. “But the government should still fulfil the promises it has made to the IMF to get assistance. Otherwise, it will create a big problem for the economy,” he said. Dependency on fuel import is another big predicament for the economy and the government should take a measured approach over it, he added. Dr Binayak Sen, a research director of Bangladesh Institute of Development Studies (BIDS), said the 7.2 percent GDP growth mostly depends on private sector growth. A big portion of the annual development programme remains unimplemen-ted every day, Sen said. “If the central government cannot implement it, then it should be passed on to the local government. ADP implementation through local government will also increase government’s popularity,” he said. Mustafizur Rahman, executive director of Centre for Policy Dialogue, said if the government wants to achieve a higher economic growth, it needs to bring out more reforms. “We have seen the first generation reforms such as privatisation, and now it is time for second generation ones such as demutualisation in the capital market and formulation of financial reporting act,” he said. “The proposed budget mentioned 1,027 projects, of which only 35 are new, while the rest of them are the projects that have been either carried over or need to be conducted in the next fiscal year,” he cited. From a political viewpoint, implementation of next fiscal year’s budget would be vital for the government itself, he added. The growing dominance of subsidy in budget allocations in recent times has started to worry the finance minister. In the proposed budget for next fiscal year, subsidy, at 18 percent of the total outlay, yet again stands to become the highest single expenditure for the government. The allocation for subsidy has been kept at Tk 34,533 crore for fiscal 2012-13, a 14.5 percent rise from this year’s Tk 30,154 crore. For fiscal 2011-12, the original allocation for subsidy was Tk 20,477 crore, which was then revised to Tk 30,154 crore, making it the highest single expenditure for the year. The steep increase in subsidy is mostly in fuel, electricity and agriculture sectors, with the upward trend mainly due to soaring petroleum prices in the world market and an increase in fuel consumption by rental power plants. Extension of support to the jute sector by the government also accounts for the inflated figures. The sector’s subsidy — historically in the range of Tk 200 crore to Tk 300 crore — went up to Tk 2,900 crore in 2011-12. For the next year, the government set aside Tk 1,700 crore. “Our subsidy payment is spiralling due to lack of sufficient price adjustment to match the increasing fuel prices in the international market,” the finance minister said in his budget speech. “This is intensifying pressure on the financial sector, government budget and the economy. We must, therefore, cut down on subsidy, especially on fuel,” AMA Muhith said. Some economists, however, have opposed the proposed move and would like the subsidy carried into the future. Their premise is that the price adjustment will push up inflation which, in turn, will hurt the poor. On the other hand, Binayak Sen, research director of Bangladesh Institute of Development Studies, would like the subsidy to be reduced for the sake of macroeconomic stability. “If subsidy pushes inflation up it will not bring any benefit,” he said. On certain quarters’ demand for equal subsidy to the power and agricultural sectors, Sen said a greater weight must be given to the power sector in the interests of investment and growth. For fiscal 2012-13, the government has allocated Tk 6,200 crore for energy subsidy and Tk 6,400 crore for power. Dr. Binayak Sen is a Research Director at the Bangladesh Institute of Development Studies (BIDS). He was lead consultant in the preparation of I-PRSP for Bangladesh and also a Member of the Public Expenditure Review Commission. His main areas of work cover growth, poverty, inequality, labour and governance issues. Here, he talks on the upcoming ADP with A.B.M. Shamsud Doza and Zaheen Zaema Khan of The Daily Star. The Daily Star (DS): Government has allocated Tk. 55,000 crore for the ADP of fiscal 2012-13. How do you evaluate the upcoming ADP compared with the performance of the current ADP? Binayak Sen (BS): The low inflow of foreign aid this year and rising fuel prices in the international market are reasons for the current macroeconomic instability. Both are external. We need to convince the donors so that we can get aid for our development budget. That needs political skill and robust economic diplomacy. We need to understand the psychology of the donors. In our economic reality we cannot avoid foreign assistance, at least for now. China also applied for IDA even as late as 1995! ADP implementation requires foreign currency. It also needs access to concessional source of finance. We are not getting it. For example, we have deficit financing of 5% of GDP, of which 2% is financed through foreign aid, and the rest 3% comes from domestic borrowing. In this fiscal year we had shortfall on account of the former, and hence we had to rely heavily on domestic borrowing. That has created problems in ADP financing. Our ADP implementation is now critically dependent on the availability of foreign assistance. In 2007-08 a similar situation prevailed. The prices of food, fuel and energy were rising in the international market and the government was constrained fiscally. During that time, major donor agencies provided at least 3 major budget-support loans, which helped to ease our problems in ADP financing and also in meeting stresses that built up on balance of payment. Unfortunately, this did not happen in 2011-12, and it may not happen in 2012-13 either. This is the time to recognise fiscal realism as a virtue of good rule. I am trying to draw attention to this aspect of governance so that the government can start addressing the trust deficit between the major donors and the government, between the West and Bangladesh, or at least stop creating new tensions or re-igniting old sore points. DS: In the next ADP the total number of projects is 1037, of which 1002 is a backlog from the current ADP of 2011-12. It seems that the ADP is burdened with projects while the implementation is poor. What is your view on that? BS: The quantity of the projects is also a problem in ADP implantation. There are projects that do not have adequate financing. Some are even “token projects” with symbolic allocations of funds, waiting to be funded in some near or distant future. My proposal is to rank the projects in order of priority. Priority should be given to ADP projects that were started but not yet finished. In any case, the whole process of ADP project selection needs to be reformed. It should not be just limited to the judgment of the sectoral ministry. There should be broader consultation, with participation from specialists and civil society representatives on the relevance of a particular ADP project, especially if it is a major project in terms of size and impact. Our economy demands fiscal decentralisation because of our enormous population (population-wise it is ranked 7th in the CIA World Fact Book). Hence, for the speedy implementation of the development budget, at least 10-15% of ADP resources should be earmarked to go directly to the local governments as conditional matching grant. The condition is that local bodies will be given 80% of the local development budget from the centre if they agree to generate at least 20% of that. This is practiced routinely in most developed countries as well in some of the South Asian countries, especially in the Indian state of Kerala where one-third of the budget goes directly to the local governments. The Union Parishads and Pourasavas will be able to make their own ADP according to their local needs. The local physical infrastructures that are not covered by either LGED or Roads and Highways Department can be covered under the local ADP. The ADP budget is inadequate for large number of Union Parishads and Pourasabhas. There has been some positive experience in Bangladesh in supporting local governments through innovative projects like Local Government Support Project (LGSP); but such projects need to be scaled up across the country with adequate fiscal empowerment, especially with regard to local-level revenue mobilisation. But, for that, we need to reform also a few taxation codes so that the local governments have the legal entitlements to raise local revenues. DS: In the next ADP, Tk. 33,500 crore of the total allocation is projected to come from domestic resources and Tk. 21,500 crore will come from external resources. Do you think the share of external resources is realistic given the non-availability of external assistance in the current fiscal year following World Bank’s suspension of funding over corruption allegations? BS: It is not unrealistic, and this I say even after the dismal Padma Bridge affair. But, the government needs to apply more efforts so that all the issues could be settled in a congenial way and without further delay. That is the national priority. I have two points to make. First, the economy should dictate the terms of politics and the nature of our external diplomacy. Economics is the concentrated expression of politics. Even for China, good relationship with World Bank is vital. Considerable efforts are needed here because the domestic resource for financing the ADP will not be enough. Tax collection has increased, but there is a long way to go before we can say that we are self-reliant fiscally. This we realise even more in times of economic slump, which is now happening again worldwide. Secondly, we cannot rely too much on domestic borrowings because we have already built up considerable internal debt on account of interest payment on government loans from domestic sources. This has become a large component of our revenue budget already. Hence, we cannot go for domestic borrowing infinitely. Besides, there are other implications of this mode of domestic financing for the private sector borrowers. Finally, the amount of external resource that we currently receive is within our “resource absorption capacity,” i.e. fiscally realistic, but steps must betaken, especially on government’s compliance standards, so that the concerns of the donors are met. In defence of the current government I would say that sometimes the donors give too much weight to anti-corruption measures than to pro-human rights and democracy measures. In 2007-08, the donors did not pay much attention to the violation of human rights that was taking place then, or that the democracy standard was not always upheld during that period. I always had a debate on this. My point is that anti-corruption, human rights and quality of democracy should be given equal weight in judging a borrowing country’s performance standard. I also maintain that these measures of good life and decent liberal democratic society should not be traded against one another. My point is that Bangladesh is still maintaining a decent though different democracy, and that it has not derailed to autocracy or to any military driven development, so some positive credit and some pro-active support by way of aid and other economic advantages need to be given to Bangladesh, at least for upholding the standard of liberal democracy. Even on the human rights performance — although the current situation is getting increasingly murkier — I would argue that it is still better than it would have been under autocracy, and that may also be taken into account. Bangladesh has a negative image in relation to corruption, but corruption cannot be discussed without discoursing on largely corruption-driven income inequality concerns, and I agree that this needs to be addressed. DS: In this ADP, among the 17 development sectors, the power sector gets highest fund followed by communication, education and religion, and rural development and rural institutions in terms of priority. Do you think the prioritisation is reasonable? BS: I think these are broadly in right direction. As I said, whatever is half-done needs to be fully completed, whether it relates to power sector or to communication. But this applies only in the case of the major ones. One of the key sources of ADP corruption is the small infrastructural road projects, which often tend to be undertaken from political consideration. For instance, some road projects in the ADP may be included because of the requests of the local members of parliament: such projects may not have any national or regional significance so we need to be cautious about it, and strike a balance between what is needed from the national point of view and what is being motivated from a political point of view. This is the last full budget before the next election, and there will be obvious political pressures for undertaking projects from local or national political exigencies. Normally, those projects tend to be of lower quality and need to be discouraged. The ministry of finance is also aware of this and that may the reason why many of those projects have been included under the ADP, but they have not been allocated resources or at most given only token resources “on the book.” This may reduce the political influence on the infrastructural and other projects in the ADP. DS: It seems that the government formulated the ADP eyeing the next elections. Do you think that political consideration has got priority over economic consideration? BS: I don’t think that was the major driving force. In the last three to four years’ ADP budget economic consideration drove the ADP selection process and not the usual political consideration. However, in this year’s budget, we apprehend there will be strong political pressure, and some quarters might want to see ADP being flushed by politically “imagined” projects, especially by national or local political functionaries and their cronies. On the whole, I don’t think that the ADP is motivated by political consideration, simply because, if you look at how the public expenditure-GDP ratio has increased over the last several years, you’ll see that there has been only a gradual increase, i.e. there has not been any dramatic increase which would have suggested that there is a spending spree on the part of the incumbent government and spending spree always helps the political contractor. I don’t think, in an analysis of the fiscal expenditure of twenty years, we will find any trend towards fiscal profligacy: the budget deficit was always maintained within the parameter of 5-6%. The inflation rate, until recently, was maintained in the range of 5-7% and the growth was accelerating gradually by half percentage point every five years. I think that has been the record for the last twenty years. I feel that the ministry of finance and the Bangladesh Bank are more or less insulated from political cronyism. But, there have been disturbing instances of undue influence of politically powerful business groups during successive regimes. For instance, due to pressure of such groups, the government waived all taxes on the profits earned by individuals who had invested in the secondary share market. This year, there is pressure by the big propertied class to remove the provision of “property tax” (imposed in the form of additional 10% surcharge on taxes paid by people owning properties exceeding Tk. 2 crores). There are also implicit financial concessions given to large-scale borrowers/defaulters who pay very little by way of “cash payment” and get away with periodic “rescheduling” of their overdue loans. Those powerful actors who profited from the share market scam of 2010 have not been pursued by the government following the preliminary report on the same by the Ibrahim Khaled Committee. New banks are being allowed to open at a time when the existing banks are suffering from liquidity shortage. These banks are not necessarily bringing any new financial products to the market, say, by addressing the needs of the SMEs and/or addressing any missing social segments not serviced by the existing banks. I am told that the ministry of finance and the Bangladesh Bank are currently under tremendous pressure from politically influential lobbies to allow a few more new banks in the private sector. People with political affiliations with the ruling party have been made “directors” of the nationalised commercial banks (NCBs). That this has been the case in the successive regimes since 1991 does not justify such a decision. NCBs should be run mainly by professional bankers. Why can’t these NCBs get out of the mess of “sick industry” loans and “classified” loans? What happened to the proceeds of privatisation from units that were privatised two decades ago? Why is there no policy talk about privatisation of state-owned enterprises anymore? Is there a chairman of the Privatisation Commission at present? Has one been appointed? In Din Bodoler Pala I think the government said that to reduce losses of the public enterprises many of them will be privatised and divested. What has happened to the mission of privatisation? Why is nobody talking about whether there has been any progress in this respect? These are examples of many unanswered questions. Even the World Bank does not talk about debt default and privatisation anymore. In those areas I find that the progress has been much less than satisfactory. But this is not all. Not only could we not reform the bad economic institutions, we also managed to undermine the good economic institutions. Thus, a few economic institutions of excellence with sound financial health, proven track record and global recognition have to face unreasonable and unfair interference “from above” — probing through committees, commissions or otherwise, which are perceived widely as being politically motivated — as in the recent probe into Grameen Bank and its subsidiary companies! The unfortunate part of these investigations is not the tension that often persists between the state and the NGOs. It is not about institutional rivalry about the command over service delivery. It is taking the form of an apparent crusade by the state machinery to undermine the fame and the moral authority of Professor Muhammad Yunus. Our world’s greatest misery is often caused not by the fight between good and evil, but marked by the fight that takes place between two key players on the same side. By that, I mean the liberal-democratic side that took part in the struggle for our independence and for its subsequent development. It is one of the most unfortunate events that I have witnessed in my professional life as an economist. DS: In the next ADP, 10 projects have been included under PPP though the government has failed to utilise a single penny from the Tk. 3000 crore of the current fiscal so far. What do you say about this? BS: We need to find out whether these PPP projects did not happen because of lack of interest on the part of private sector or because of the macroeconomic stabilisation concern that the government could not allocate enough resources to play its own part in order to support these PPP projects. We need to find out the real causes. Is it the lack of interest on the part of foreign or domestic private sectors in those projects? Since there are ten projects of Tk. 3000 crore, which means Tk 300 crore on average, that makes them big projects. We need to know what the main cause is behind non-implementation of each of these big PPP projects. DS: Our ADP implementation rate is poor. This time the Planning Commission has taken initiative to form a body to monitor ADP implementation. How do you evaluate this move? How can we do better in implementation of the ADP? BS: I have heard about it and the finance minister has been saying that there have been certain institutional changes in this regard, but we need to find out more about what actually took place. I was a member of the Public Expenditure Review Commission in 2001-03, which was led by Mr. Hafizuddin Khan. I recall that we made a number of suggestions with regard to institutional monitoring of major ADP projects. For example, we suggested new institutional mechanism — an improved process for the selection of ADP projects (especially exceeding certain size thresholds) and also how they need to be implemented and monitored. For that, there has to be a civil society, government and academic partnership programme so that these project implementations (especially for large projects) can be monitored. In India, for instance, in the last fiscal year they created an Independent Evaluation Office outside the orbit of their planning commission to monitor a selection of major central government projects every year. The idea is that the Planning Commission needs to be supplemented by evaluation office that would run very much like the evaluation offices in international agencies such as World Bank or ADB. Our own version of IMED in the Planning Commission is not up to this task for a variety of reasons (it is actually used as a dumping ground for the civil servants; the IMED has been provided with very little incentives and resources, and is also deficient in evaluative skills). I strongly suggested earlier that a similar office as in India needs to be created here as well. In fact, we could go further than that. To celebrate Rabindranath Tagore’s 151st birth anniversary, his works and philosophy, Chhayanaut held a two-day ‘Rabindra Utshab’ (festival) at the main auditorium of Chhayanaut Sangskriti Bhaban in Dhanmondi, Dhaka. The festival began on May 8. Leading and upcoming Tagore artistes of the country as well several cultural organisations participated in the event. This is the fourth ‘Rabindra Utshab’ by Chhayanaut. The organisation was founded in 1961, on the occasion of the Tagore birth centenary. The festival began with a song-and-dance presentation by the young artistes of Chhayanaut. Several dancers performed to a live rendition of the song “Momo Chittey Niti Nritye”. Dr. Binayak Sen presented as essay, titled “Bhinno Mot-er Rabindranath: Chithi Potrer Shakkho”, on the opening day. President of Chhayanaut, Dr. Sanjida Khatun, welcomed and thanked all at the event. Dr. Binayak Sen meticulously pointed out the excerpts of the constructions of alternative that Tagore created, especially in his letters written to several litterateurs, his friends and family members including Priyonath, Sudhindranath Dutta, Buddhadev Bose, Amiyo Chakraborty, Sanjay Bhattacharya (editor of Purbasha), Kadambini Devi, Indira Devi and Hemanta Bala Devi. “We find Tagore’s viewpoints on political, social, economic, agricultural and theological opinions and philosophies in his letters. The bard was absolutely a free thinker and was never stuck to certain ideas. He had even gone against the societal customs too. Sometimes, he clarified his visions with a hint of ambiguity but never leaving out humanity. Tagore’s love for entire humanity was his unique religion,” said Dr. Binayak Sen in his essay. A cultural programme followed the presentation. The event featured dance performances, poetry recitation and rendition of choral and solo songs. Artistes of Chhayanaut performed “Kothao Amar Hariye Jawar Nei Mana” that seemed to reverberate with the presentation of Binayak Sen, in tune. Noted dancer and teacher Sharmila Banerjee, her daughter and also a Chhayanaut teacher Sudeshna Swayamprabha, and four other artistes of Chhayanaut danced to a Tagore song “Bajey Bajey Romyobeena Bajey” at the event. Chhayanaut artistes, Rafia Sultana and Sonia Rashid, also presented a duet dance. A number of Chhayanaut and several guest artistes including Swati Sarkar, Nilotpal Shadhyo, Chhaya Karmakar, Fahmida Khatun, Jhuma Khandakar, Elora Ahmed Shukla, Pratik Endo (Sylhet), Samapti Roy (Faridpur), Kanchan Mostafa, Tania Mannan, Saikat Mukherjee, Shusmita Ahmed Borna and Suman Chowdhury and others staged solo performances. Artistes of Jatiyo Rabindra Sangeet Sammilan Parisad (Dhaka City) also performed a group song at the event. Meer Barkat and Israt Jahan recited at the programme. Almas Ali on violin, Asit Biswas on esraj, Iftekhar Hossen Shohel on keyboard, Pradip Kumar Roy on mondira and Enamul Haque Omar, Swarup Hossain, Gautam Sarkar and Iftekhar Alam Prodhan Dollar on tabla accompanied the singers. The curtains came down on the opening day of the festival with a rendition of the national anthem. Dance performances, poetry recitation, and renditions of songs by leading and upcoming Tagore artistes marked the concluding day (May 9) of ‘Rabindra Utshab 1419’ that drew a large number of Tagore enthusiasts. Mobile phone operator Robi assisted the programme while ATN Bangla was the media partner of the festival. An economist yesterday warned the government of “uneasiness” in the banking sector. “It seems the banking sector is facing some uneasiness, particularly nationalised commercial banks,” said Binayak Sen, research director of Bangladesh Institute of Development Studies (BIDS). Sen urged the government to be stringent about issuing permission for new banks. He spoke at a seminar that focused on socio-economic development in the first three years of the grand alliance in power, organised by the ruling Awami League at the auditorium of the Bangladesh Medical Association in Dhaka. He said tax exemption for large investors was not proper in respect of social justice and growth. Sen said the country’s tax-GDP ratio should be increased by mobilising resources from domestic sources to take the investment-GDP ratio to 32 percent from 24 percent now. “Otherwise, we will not be able achieve 8-8.5 percent economic growth to take Bangladesh to a middle-income country,” he said. “Steps have been taken, but they are not sufficient. 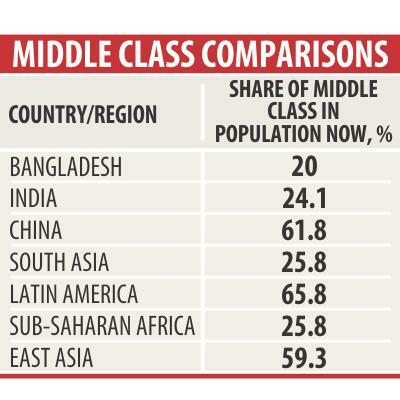 Bangladesh has still the lowest tax-GDP ratio in South Asia,” Sen said. Keynote presenter Mashiur Rahman, economic affairs adviser to the prime minister, said it would not be possible to run the economy without long-term accountability. “The government should enhance its capacity to use foreign aid,” Rahman said. Finance Minister AMA Muhith said the economy of Bangladesh reached a level different from 2008. The government was unable to spend much of the $14 billion foreign aid in the pipeline, he said. Moazzem Hossain, editor of The Financial Express, said Bangladesh would not be totally immune to the persisting global economic crisis, as 40 percent of the country GDP is linked with international business and trade. The government needs to pay attention to urban poverty alleviation and policymakers need to take long-term and sustainable measures to combat the problem, a leading economist said yesterday. “We lack sustainable measures to eradicate extreme poverty in the urban slum areas. Instead of taking intermediate steps to eliminate poverty, the government needs to make long-term policies to fight poverty at large,” Binayak Sen said. The government needs to rearrange the size of allocations it makes under different safety net programmes, pointed out Sen, research director of BIDS. He suggested the government ensure better access to capital and healthcare, so the urban poor living in slums can improve their livelihood and quality of life. He also stressed the need to create sustainable income generating activities for these people. Sen was presenting the insights from the midterm evaluation of a project titled Breaking the Cycle of Urban Chronic Poverty, jointly organised by the Dustha Shasthya Kendra (DSK), a non-government organisation, Shiree and UK Aid at the Samabai Bhaban in Dhaka. The DSK-Shiree project conducted the survey on 1404 people living in Kuril and Kamrangirchar in Dhaka, where the project spent Tk 28,000 for each person over a period of two years. The survey found that the additional income has made a qualitative impact on the targeted people, improving their standard of living. It also found that the notion of extreme poverty is gradually disappearing in these areas although a qualitative difference is yet to be perceived.